Al ajillo is a condiment in Mexican food that means combining guajillo and ajo (garlic). 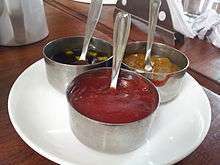 Various dishes from Spain with the name Al ajillo, are flavored with garlic, and sometimes with chilli. It is a dish made with shrimps that are fried in a pan with butter or vegetable oil, in which slices of garlic and guajillo chile have been frying. It is seasoned with salt, black pepper, lemon and parsley or coriander. 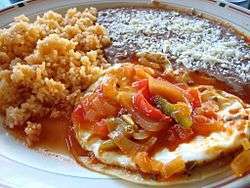 It is a dish made with fish meat that is fried in a pan with butter or vegetable oil, in which slices of garlic and guajillo chile have been frying. It is seasoned with salt, black pepper, lemon and parsley or coriander. Bayless, Rick. Mexican Kitchen. (1996). ISBN 978-0-684-80006-6.